Water gun assassin has been a tradition on campus for two years and it will continue this year as well. 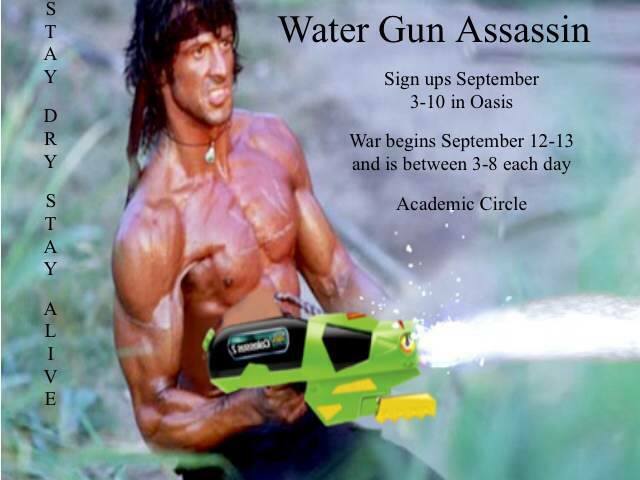 In 2012 was the debut of water gun assassin at campus and it was definitely a success. For a period of about 24 hours, students hide from and shoot other students with a water gun provided by CAB. What many people don’t know, is that it is not just bragging rights that the winner receives. CAB is known for giving excellent prizes at events such as BINGO, and water gun assassin is no different. This year, the winner will receive a Samsung Tablet. Sign ups are still going on for this year, don’t miss out on having the opportunity to make history by winning the third annual water gun assassin.